The Yamaha XSR700 is here — and it looks awesome. I'm not going to lie, I was a little worried about this one. The "Yard Built" MT-07 (that's what they call the FZ-07 on the other side of the pond) custom by Shinya Kimura that was done as a test to see if people liked the idea of a retro FZ-07 felt like a complete miss in the looks department. While the idea was cool, the build came off way too Shinya and not nearly enough "what people would buy." I had some pretty huge doubts that the Yamaha designers would nail it. Fortunately, my fears were dead wrong. This thing is just heaps of right. 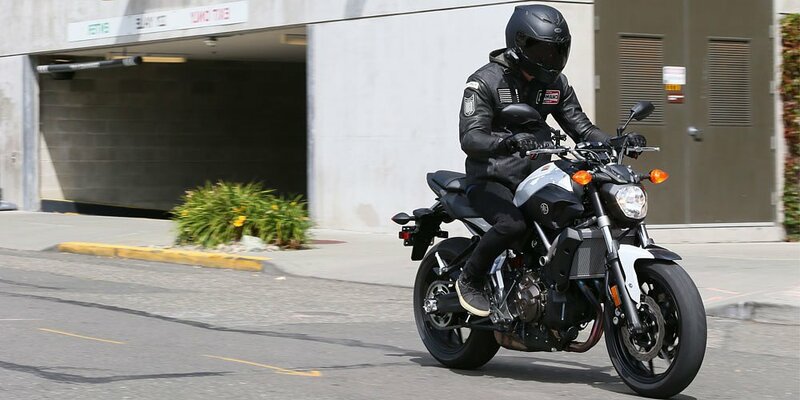 The XSR700 uses the same motor and frame as the FZ-07, a bike many sites crowned their "bike of the year." The XSR adds a two-texture leather seat, an aluminum fender, headlight brackets, and fuel tank, mesh side panels, a shorter exhaust can, and a host of manufacturer accessories. The XSR700 will go on sale in Europe this November in both Forest Green and Garage Silver, but the price hasn't been released. The Yamaha XSR700. Yamaha photo. At first glance the XSR might look like a retro but, if you take a closer look, I think you'll agree it's much more like what Ducati made with the Scrambler: a nice looking standard motorcycle. Don't let the round headlight and tail light or the guy in the pictures with his open-face helmet and goggles fool you. The exposed engine, lines of the tank, and wheels all scream standard, and it will sound like one, too. This bike, like the Ducati I told you was the best bike for most people, is exactly the bike the world needs. From my seat on the board of directors of hipsterdom, "cafe racers" aren't actually getting more popular. Hipsters are diversifying between cafes, Harleys, and dual-sports. Ducati is selling out of Scramblers, but it isn't just hipsters who are buying them. It's everyone. The Yamaha XSR will be unveiled with full specs and price this November, we assume at some small markup over the $6,990 FZ-07. The real question is, how much would you pay for your Yamaha FZ-07: Stylish Standard Edition?